Nick’s Grandma Alice emailed me this weekend to tell me that she’s having a dinner in a few weeks and she is in charge of making salads. She’s going to make my Chinese Chicken Salad and a taco salad. She wanted to know if I had a good taco salad recipe. All you have to do is ask! 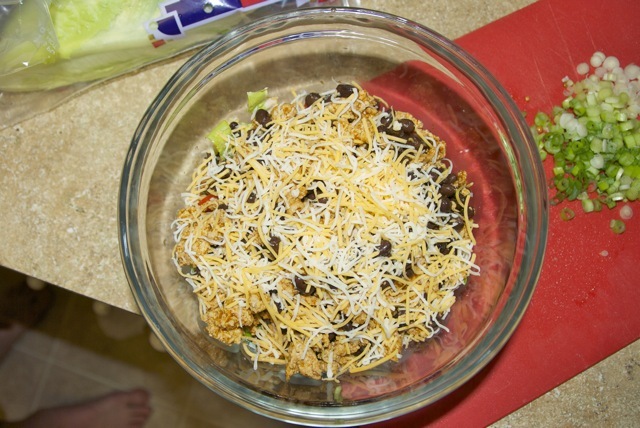 I actually hadn’t made taco salad before, but it sounded pretty good! I wasted no time and decided to make it for our next meal. I couldn’t find a recipe that I really liked, so as usual, I combined a few different ones. 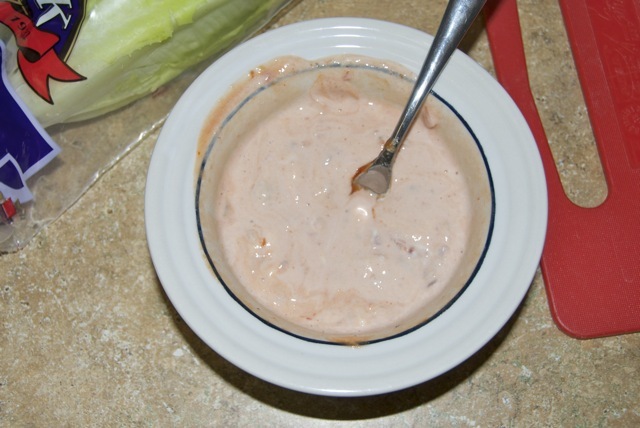 To make the dressing, combine sour cream and salsa in a small bowl. Set aside. Cook the meat with taco seasoning, according to package directions. Add the beans to the pan in the last 2 minutes of cooking. 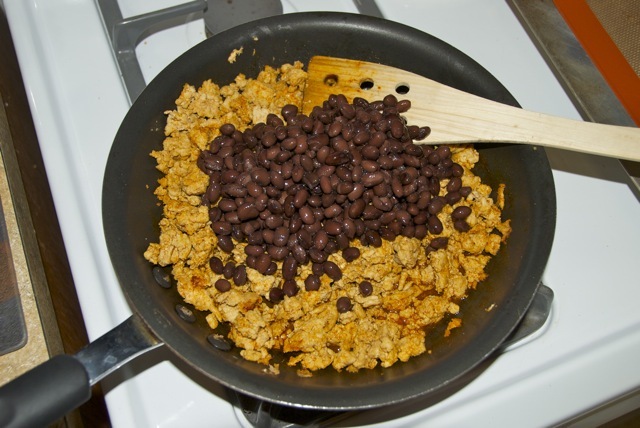 Let the meat and bean mixture cool to room temperature. 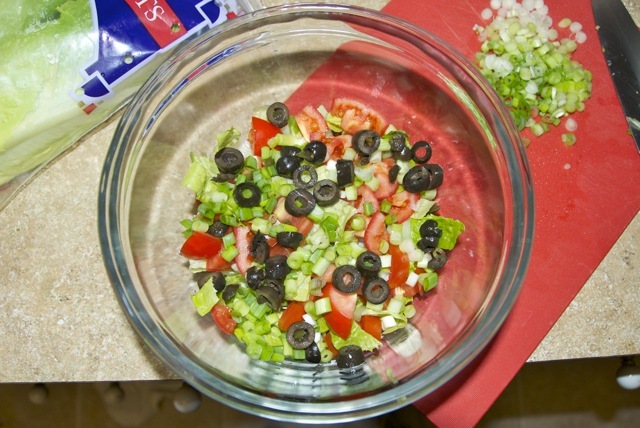 In a large bowl, place half the lettuce, half the tomatoes, half the scallions and half the olives. Top with half the dressing. Top with the meat and bean mixture (you can reserve a little bit for decorating the top, if you want to be fancy). Sprinkle half the cheese on top. Add the rest of the veggies, dressing, and cheese (and meat mix if you reserved some). 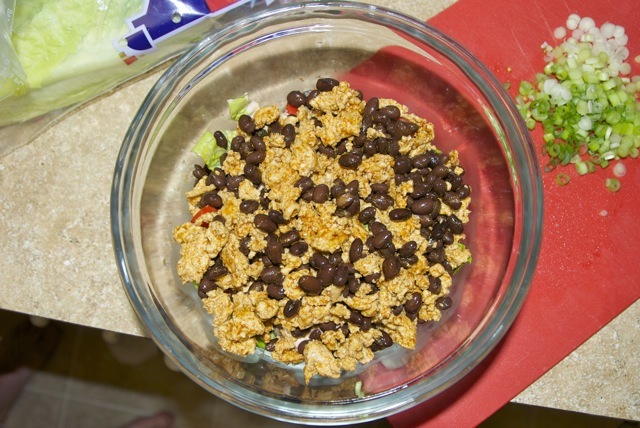 Serve with tortilla chips for scooping up all the yumminess! 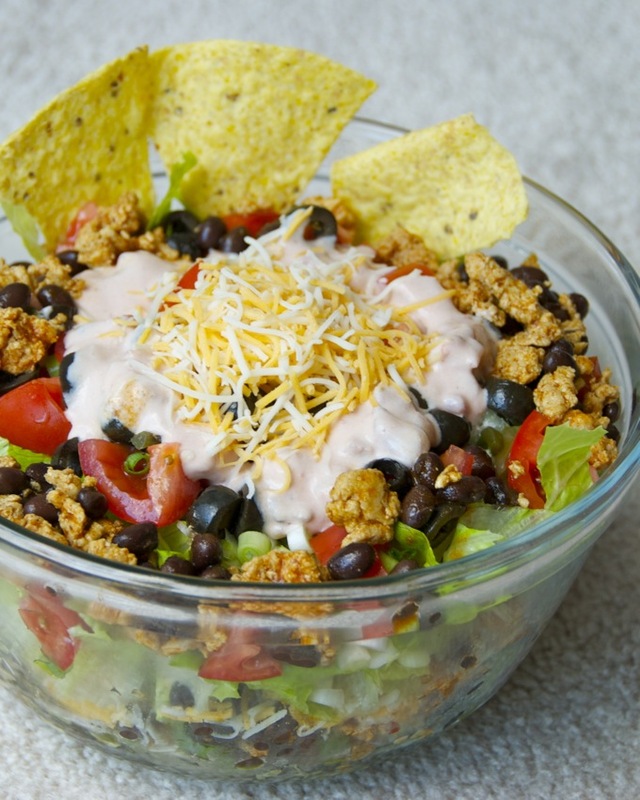 You could also top with a layer of crushed tortilla chips. I knew we’d have leftovers, and I didn’t want it to get soggy, so I didn’t. Chips on the side were just as good! The salad was really good! And unsurprisingly, it was WAY better than the last 3 taco salads I’ve had– at 3 different Mexican restaurants in Enid. Enid has about 12 restaurants and I think 8 of them are Mexican places… which are all horrible. Have I mentioned I’m eager to get out of here? Anyways, hope you like it, Grandma! And if anyone else has any requests, just send them my way! Congratulations! This post was one of the top 5 viewed posts on Food Frenzy for May 2012. Congratulations! 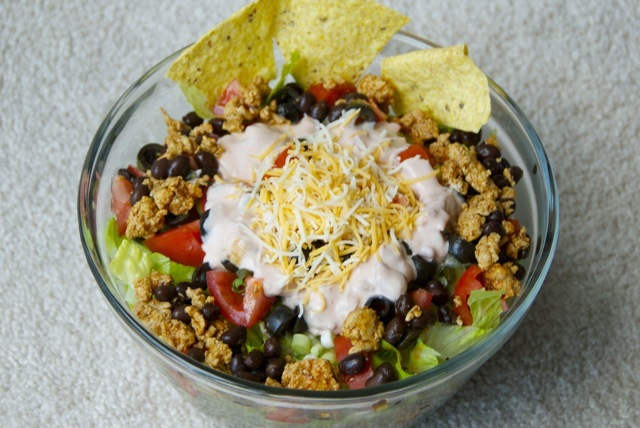 This post was one of the top 5 viewed posts on Food Frenzy for June 2012. That’s two months in a row at the #1 space. Great Job! Congratulations! This post was one of the top 5 viewed posts on Food Frenzy for July 2012. That’s three months in a row!!! I made this for the secret recipe club posting today. It was amazing. 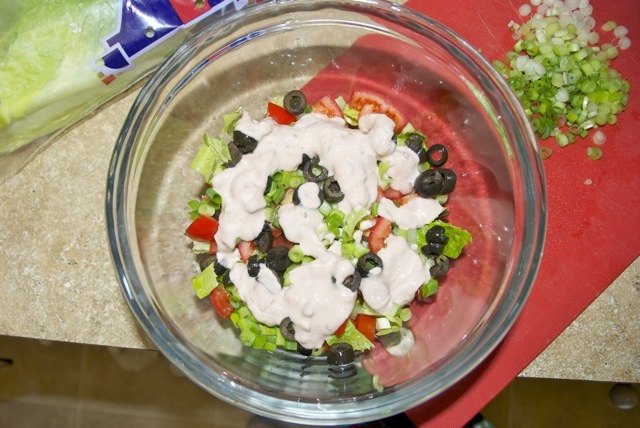 At first my husband was skeptical about salad for our dinner and only salad but he loved it. Actually said we should have it again. Great recipe!